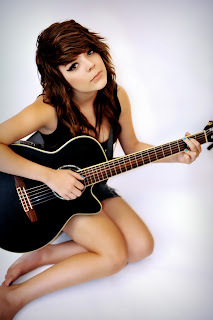 All Indie Magazine: Interview with Audrianna Cole: "A Tragic Tale Leads to a Happy Ending"
Interview with Audrianna Cole: "A Tragic Tale Leads to a Happy Ending"
Audrianna Cole is a future major Pop artist from Salem, Oregan. You may not have heard of her, so why am I calling her a “future major pop artist”? …Because, Audrianna Cole is headed toward the mainstream spotlight. Audrianna Cole's sound is very commercial and diverse. Songs like, “Follow Me” could easily be heard in television commercials, specifically for fun trendy sports car. Her song, “Misplaced” was co-written and produced by Andrew Boss of LGMR, Inc. This track belongs in a romantic film. The one song that really stands out as a potential Top 5 hit is, “Shrug it Off”. This song deserves tons of airplay on every mainstream radio station across the US and the world. It has an incredible chorus hook. The entire song is infectious and has the ability to have you singing and repeating over and over, even if you’re not fan of this style of music. Much of the creative influences and process was definitely not achieved alone. Cole had a lot of help with multiple well-known and talented songwriters, producers, and engineers including Andrew Boss. Tracks on this album were also co-written with people like Jennifer Hanson. Hanson wrote music for Gwyneth Paltrow for her movie, Country Strong. She also wrote music for The Wreckers and Bucky Covington. Cole wrote with Michael Davey for the song “Hello”. Cole also wrote with Billboard Top 100 singer/songwriter, Mark Dawson, and Liz Rose, who won a Grammy for one of Taylor Swift’s songs. Rose is credited for songs she wrote for Tim McGraw, Trisha Yearwood, Bonnie Raitt, and several others major recording artists. Cole’s also worked with Stefan Skarbek (songs written for Amy Winehouse) and Linda Perry, formerly the lead singer and guitarist of 4 Non Blondes. Cole also worked with Joshua M. Schwartz and Brian Kierulf of KNS. KNS is know for their work with Britney Spears, Nick Carter, Willa Ford, Tarkan, Gia Farrell, and Lady Gaga. With a recipe of famous producers, singers, and songwriters such as these talents, Audrianna Cole is well on her way from becoming an unknown 13-year-old karaoke singer from the kitchen of her in Salem, Oregon home, onto a road that leads her into becoming a household name. All of this potential success could not be been done without her father. Had it not been for a tragic car accident that nearly took his life, it ultimately changed the course of both their lives and onto a path of music. Without that life altering car crash, Audrianna would not have been home schooled and there to help take care of her father and she may not have had time or the opportunity to create the incredible music we hear today. Find out exactly what happened in my exclusive audio interview with Audrianna Cole on The Great Unknowns Presents. Purchase her song, "Lovely "
Really love the latest song on sound cloud! "I wanna love i can feel"
Great mix and duet with Jay Loftus! It's great to hear that beautiful music is being made because of something as tragic as a car crash. I hope they were able to get the help of a car accident attorney orlando. Thank you for sharing this article, I never knew this before.